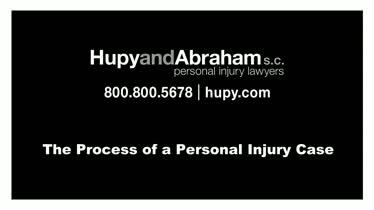 Wisconsin, Illinois & Iowa Personal Injury Law Firm | Hupy and Abraham, S.C.
Our experienced legal team helps victims who have been injured in all types of accidents, from motor vehicle crashes, dog bite incidents, slip and fall accidents, negligent security incidents, nursing home abuse or negligence, and police brutality, to injuries caused by a dangerous drug or medical device. When you have been seriously injured—or lost a loved one—due to the negligence of someone else, the future may seem both uncertain and overwhelming. Our experienced personal injury lawyers are here to help you protect your recovery, and they’ll be with you every step of the way. Our firm goes above and beyond the call of duty for every client. From your first call until you receive your recovery, we will provide you with the best possible representation. Over the years, we have represented more than 70,000 injured clients in Wisconsin, Illinois, and Iowa, and we have recovered more than $1 billion on their behalf. We would be pleased to provide you with a free, no-obligation consultation. Please call, text, or fill out our online contact form any time—24/7/365. It is important to report your accident as soon as possible, as long as you can do so safely. Some accidents, such as motor vehicle crashes or negligent security incidents, should be reported to the police. If you are unsure about how to report other types of accidents or injuries, contact our personal injury law firm for assistance. Keep all of your accident-related evidence. Photos from the accident scene; the names and contact information of witnesses; a journal detailing your injuries, medical bills, and other receipts documenting your expenses; and other evidence will be important to your financial recovery. As soon as possible after your accident, go to the emergency room or see your doctor to obtain a diagnosis of your injuries and a treatment plan. Be sure to follow your doctor’s advice starting with this visit and keep all future appointments. Watch your words and social media posts. In a personal injury case, anything that you say or post may be misunderstood and used against you during settlement negotiations or in court. Therefore, it is important not to speak directly with insurance adjusters or to post about your accident, injuries, or activities on social media sites. There are many details involved in a personal injury case, and it can be overwhelming to know what to do and when to do it. You don’t need all of the answers. Instead, contact our personal injury law firm, and we will make sure all of your rights are protected as we fight for your fair and just financial recovery. Your first consultation with us is free, and we have a win or it’s free guarantee. "I didn't realize I even had a case until I contacted them." Tijuana J. One of the best ways to get to know our personal injury attorneys is by finding out what people who already know us think about us. Our law firm has more than 300 five-star Google reviews that you can read to learn more. No matter where you were hurt in the states of Wisconsin, Illinois, or Iowa, the legal team at Hupy and Abraham is here to help you. We have 11 conveniently located offices throughout the three states including Milwaukee, Appleton, Green Bay, Madison, and Wausau, Wisconsin; Bloomington, Gurnee, and Rockford, Illinois; and Cedar Rapids, Des Moines, and the Quad Cities, Iowa. If you can’t come to one of our offices, we will come to you. A $500,000 Settlement - Our Client Catelynn Varichak Catelynn was injured in a John Deere Gator accident. Working with Hupy and Abraham, she was able to secure a $500,000 settlement. “They’ve given my life back to me.” Hupy and Abraham, S.C. client Sean Westhause talks about what it was like working with the firm on his accident case. 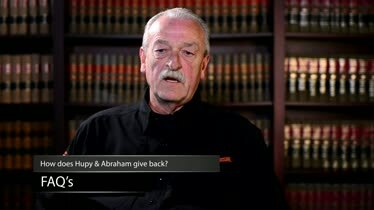 How Does Hupy and Abraham Give Back to the Community? Giving back to the community is very important to Hupy and Abraham. Find out how this law firm has contributed to the community over the years.